A sample of this collection can be found in the Agricenter lobby. The Jesup Collection of North American Woods is a collection of 455 tree stumps that were collected from all over the country beginning in 1879, went on display at the American Museum of Natural History in New York City in 1890, and was considered completed in 1905. Morris K Jesup, Courtesy American Museum of Natural History. Morris Ketchum Jesup (1830-1908), a businessman and philanthropist, funded numerous scientific expeditions in the newly expanded United States and the Artic. He became president of the American Museum of Natural History in New York City in 1881 and later was chairman of the Forestry Committee in New York. From 1879-1884, Professor Charles Sprague Sargent (1841-1927), a dendrologist, and the Director of Harvard’s Arnold Arboretum, led a group of experts in a survey of the extent of forest areas in the new territory of the United States. This expedition was as a part of the government’s 1880 Census of the United States and Sargent was able to record data on forests for scientific publication. The preliminary result was a list of all known trees called A Catalogue of the Forest Trees of North America, published in 1880. The forest products industry was a growing segment of the economy and there was a need to put the gathered scientific information into a form the public could see. Morris Jesup offered to personally pay for Sargent to collect specimens of all known trees in North America while he was on expedition for the census. Sargent selected the best of each species and prepared a manual, a process that took about 20 years. Around the turn of the century he published Silva of North America in 14 volumes which was a result of his time spent collecting the Jesup Collection of North American Woods (American Museum Journal, Vol 18 p241, 1918). Jesup’s original intention was to collect the woods that could be used in the building and manufacturing process and then move on to collecting minerals. He quickly found that there were more trees than anticipated. The cost for securing them increased and the space needed to display them put a burden on the museum. By 1890, the collection was complete enough to be officially displayed in the American Museum of Natural History in New York. * There were 455 specimens of 425 different species on display with only nine species that were known to exist but not yet obtained (New York Times 11-16-1890). The collection was considered “practically completed” by 1905 (Morris Ketchum Jesup: A Character Sketch, 1910). Sargent's list of trees in the Jesup Collection were published in 1885 in his book Woods of the United States. *Some sources say the collection was displayed beginning in 1883 (Woods of the United States exhibit 1902-1938, 2012). Click here to download a copy of the ledger. The collection was located on the first floor of the museum and tree stumps were about six feet tall and cut to show the trunk, natural wood with the grain, the cross section, and the oblique section. The left side of the cut wood was polished and the right unpolished. 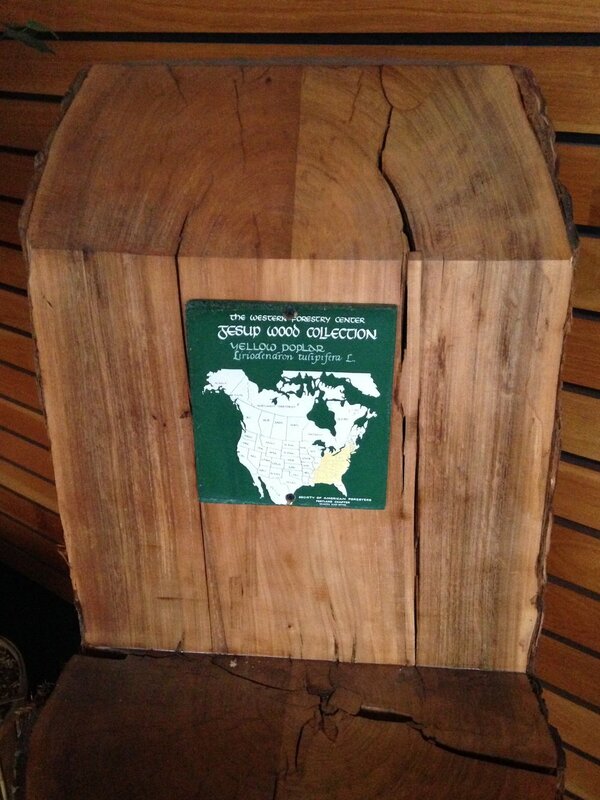 Next to it were planks of harvested timber to show the industrial value and a map of the growing region. Mary Sargent, Charles’ wife, added watercolor drawings of 200 specimens showing flowers, leaves, and fruit. There were also photographs of the tree in its natural habitat and tables showing its density, gravity, pressure resistance, and chemical composition. The California redwood, 12’ in diameter, 37.5’ in circumference, and weighing 11 tons was so large it had to be dragged into the museum through a tall window because it did not fit through the door (New York Times 11-16-1890; The Students Journal, NYC, Jan 1892 vol 21; Journal of a Tour in the United States, Canada, Mexico, p332, 1897; Morris Ketchum Jesup: A Character Sketch, 1910). A second, related collection, called the Jesup Collection of Economic Entomology showed insects, disease, and destruction of trees. The representations of eggs and larvae as well as the diseases were created out of wax and were displayed nearby behind glass (New York Times 11-16-1890; Morris Ketchum Jesup: A Character Sketch, 1910). In the 1890s, Jesup cut off the bottom 14" of the tree stumps and donated them to Harvard's Arnold Arboretum where Sargent was Director (Woods of the United States exhibit 1902-1938, 2012). The stumps are currently 56" tall. In 1885, it was noted that the collection is the first effort to gather native woods together into one collection “on a scale commensurate with the extent of the new continent and the importance of its forests” (Report of the 54th meeting of the British Association for the Advancement of Science, p778, 1885). (Woods of the United States exhibit 1902-1938, 2012). When the museum was reorganized in 1920s the collection was put in storage. In 1964, two box cars moved the collection from the American Museum of Natural History to the World Forestry Center in Portland, Oregon. The building burned down but the collection was still in the boxcars and were undamaged. They were displayed in 1971 in the new building and was one of the main exhibits. The World Forestry Center donated it to the Lumberman’s Club of Memphis who donated it to the Agricenter in 1994 (Woods of the United States exhibit 1902-1938, 2012).